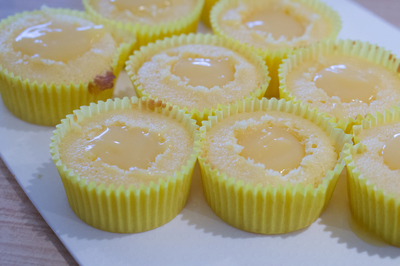 Preheat the oven to 190 C. Line a 12-hole cupcake tin with paper cases. Divide the mixture between the cases and bake in the oven for 15-20 minutes or until the cake bounces back when lightly touched. Leave to cool. Meanwhile, make the curd by combining all the ingredients in a small saucepan over medium-low heat. You MUST keep an eye on it and stir at all times to prevent it from curdling. Once the butter melts, increase the heat to medium and cook, stirring constantly, for a few minutes until mixture boils and thickens. Remove from heat and transfer to a bowl. Cover with plastic wrap and refrigerate for an hour to chill. 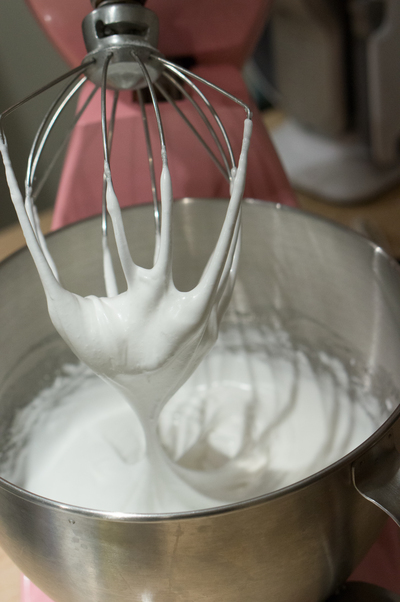 To make meringue: Whisk the eggs white in a clean, dry bowl until soft peaks form. Continue whisking and add sugar, 1 Tbsp spoon at a time, until fully dissolved. 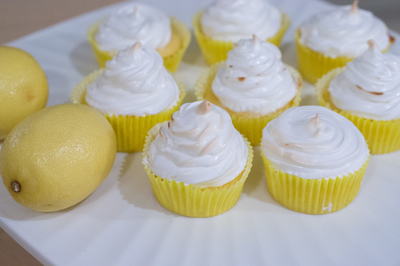 To assemble cupcakes: Using a sharp serrated knife or an apple corer, cut a hole in each of the cooled cupcakes. Spoon the curd in to the holes. Using a piping bag, pipe the meringue on to the cupcakes in your favourite design. 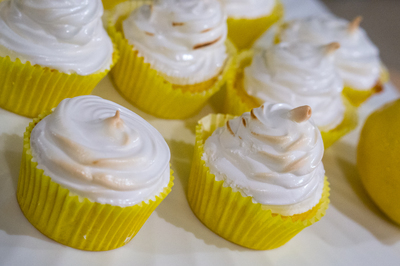 Use a cook’s blowtorch to lightly toast the meringue. If you don’t have a blow torch you can bake the cupcakes at 220 C for 3-5 minutes until the meringue is toasted but I would say invest in a blow torch as the end result is better!